A man about 70 years old complained to me that he bruises very easily. This had happened for a few years. The condition had started suddenly and it had stayed every since. He told me that the slightest knock would make his hand bruise. For instance, when he accidentally knock against the corner of a table or edge, the bruise would appear and take long time to heal. 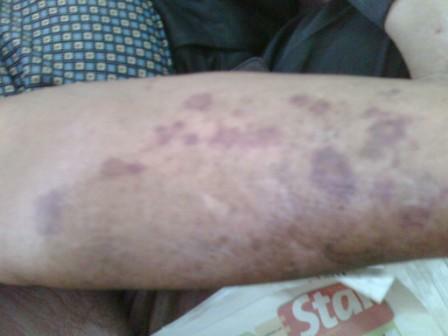 And when one area heals, the bruise appears in another place or another arm. Sometimes, he would wake up with a bruise on his arms. Once, he went for massage and the masseur was just massaging like normal- and later one whole area of his skin on his arms was like about to peel off. Therefore, he had to be careful not to rub his skin or apply oilment. When he saw the doctor, he was told that his skinned could have thinned out as part of the aging process. But there’s another factor in play- this man’s emotional well-being. The bruise tells me the tough exterior, a brave front that he was trying to put up for everyone to see. You see, he was with a woman that he dearly love- he had left everything for her. And their love lasted for about 3 decades- they were very happy. Then the lady passed away a few years back. He loved her dearly till the very end. And spoke fondly about her- recalling past events …of how she used to be and what she used to do. After she passed away, he did not know what to do, or where to go. As the happiness moments of his life was spent with her- and they go and did everything together, now he is left on his own. This is an extremely extremely kind and mild mannered man- he’s the type who never want to trouble or make anyone worry about him. He still keep her photo in his wallet and her framed picture in their room. He must have been missing her dearly- now that he lives alone, makes it even harder to bear. Bruising in the skin could symbolically indicate that he is ‘bumping into things’ because he had lost his sense of direction….and he no longer know where to go. Imagine when we feel lost, alone, sad and is no longer able to see where to go, or not having something to look forward to anymore….like trying to walk in the dark with your outreached hands trying to feel in darkness in a totally new, lonely and unfamiliar territory? Surely we may end up bumping into things and hurting ourselves, rite? I would think that he could benefit from grief counselling- to help him get over the grief and have a clearer sense of direction to move on. I am sure his dearly beloved would not want to see him like this. But due to his background- and that he is not the type who is open about his emotions, it was not easy for me to broach the subject as we are not close and it would be awkard. But I do hope that the article would help those who are searching for answers about easy bruising for no appearent reason- it could be medical (do check with a doctor), genetic ….or it could be emotional. If it is emotional, the problem may go off at mysteriously after the emotional issue is resolved. The effect of how the state of the mind affects our body is also more evident when nothing showed up in medical tests and the best and most expensive dermatologist creams does not work…or they worked for a while but loses its affect not long after. There are a lot of reasons you may bruise easily…One is heredity…Another pertains to how much fat we have…You may also want to get checked by a Dr. to make sure you’re getting enough vitamins…Deficiencies in B12, C, K, and folic acid could also be causing your skin to bruise easily.